Welcome back folks! I've got a Team Canada concept to share today, and then a quick announcement about a second blog I've created. 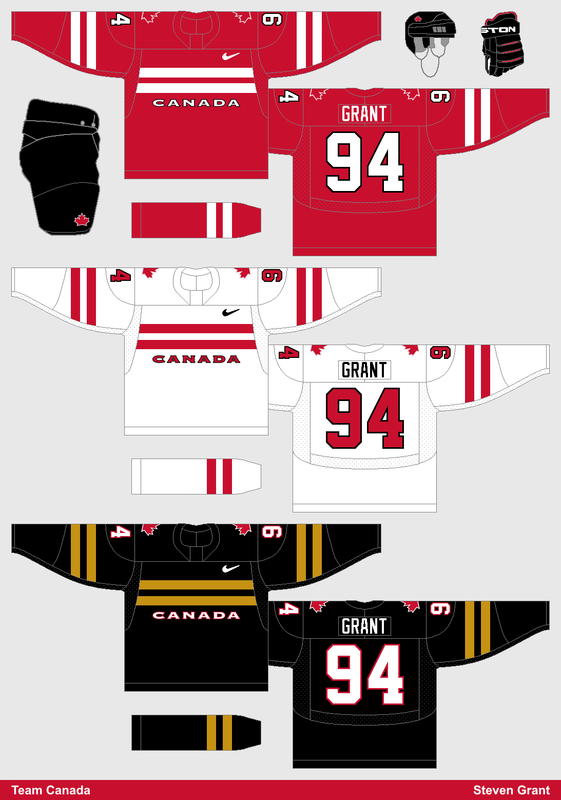 Back in September 2013, Chris from Icethetics received a tip that Canada's 2014 Olympic team would have a black third jersey (along with a brief description of the jersey). He then asked me to create a mock-up/prediction based off of that description. In the end my mock-up (which you can see below) wasn't that close. Nevertheless, I've brought back that design (with some updates) and turned it into the set of jerseys seen above. As you can see, it was a bit different from their actual third jersey. Meanwhile, I've created a new blog called Snapshots with Steven. The purpose of Snapshots with Steven is to use photos to help tell stories about interesting experiences. The first post is all about the August 2017 total solar eclipse, both the good (the eclipse itself), and the bad (the gridlock afterwards). Go check it out, and let me know what you think!